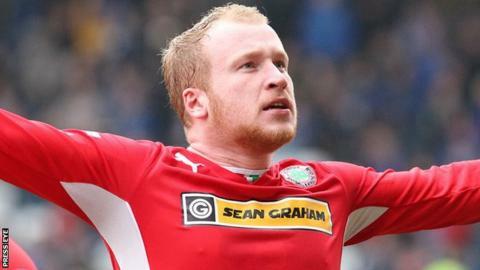 Cliftonville striker Liam Boyce has been voted the Irish League's player of the month for March. Boyce, who will be 23 next week, scored six goals during the month including a hat-trick against Ballinamallard. He also netted twice in last Saturday's crucial 3-1 win over Irish Premiership title rivals Linfield at Windsor Park. Linfield defender Billy Joe Burns was second in the monthly awards with Boyce's Cliftonville team-mate Chris Curran in third place. It is the third time Boyce has won the monthly award and he was named the player of the year for last season. Cliftonville's win on Saturday saw them replace Linfield at the top of the Irish Premiership table. Tommy Breslin's reigning champions are one point ahead with four matches remaining. Cliftonville have lifted the Irish League trophy on four occasions but have never won back-to-back titles.